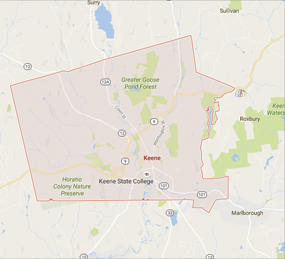 The Keene Heritage Commission is an advisory and review commission of the City of Keene which is responsible for inventorying, promoting and actively seeking protection and preservation of Keene's resources that are valued for their historic, cultural, aesthetic, archeological and community significance. Meetings are generally held the 2nd Wednesday of every other month at 4:00 PM in the Trustees' Room of the Keene Public Library. 1) Conduct research, publish findings and promote the establishment of historic districts within the City of Keene. 2) Assist the Keene Planning Board in the development and creation of those sections of the master plan, standards and regulations that address cultural and historic resources. 3) Consult with and coordinate activities with other boards and commissions as well as local service and nonprofit groups to achieve common preservation goals. 4) Publicize to property owners and to the general public the need for and the benefits of protecting and preserving Keene's cultural and historic resources.